Inside it oozes class and you feel that little bit more important walking around amongst the tables. However, this type of casino is not something which everyone will enjoy as it is more high-end, so loud and drunken behavior might be frowned upon - even after a deserved win. Smart, formal and casual wear is allowed at the club under the current dress-code but a piece of advice is to always dress a bit smarter than you were originally planning on - just to be on the safe side. One of the main features at this casino is their dedicated Poker Room. They have really embraced Poker as a vital part of their operation over the last couple of years and this is one of the best places to go in London if you are after a bit of Texas Hold 'Em. However, things will not be cheap as the lowest buy-in for the cash games comes in at £50 and the blinds are at £1 and £2. Other than the impressive Poker offering this casino does tick all the boxes when it comes to your traditional games. You will find a couple of tables for Blackjack, 3 Card Poker and Baccarat. They are joined by a bunch of different slot machines and some American Roulette tables. Their famous Silver Room is where you will find anything and everything to do with electronic gambling. The restaurant at the Mint is actually not as big of a selling point as you might expect with it being a Genting. With this said - it offers a wide variety of meals and the food is overall very good. If you are looking for traditional London cooking then you will be in the completely wrong place as this is more of an exotic menu with everything from Scallops to Arabic grilled baby chicken. This A La Carte restaurant is open from 8pm all the way through to 1.30am. It is worth noting that they usually announce a new menu for every season so check out their website before to see what is on offer. The late bar at the Mint is very relaxing - a brilliant place to cool down after that one big hand you raked in or that you saw slip away. They serve a wide variety of drinks - from cocktails to beers and wine. This is also a sports bar which means that almost all major sporting event - local and international - will be on here. So when your favourite team or player is in action you can take a seat and enjoy whilst still being able to go for a spin or two when you feel like it. If you head over to the Genting Mint website to find their latest tournaments and events you will quickly realize that it is almost all about Poker. There are several daily or weekly tournaments with huge buy-ins and prize money. However, this does mean that the standard games are quite neglected and for the casino lover - and not the poker fan - this can be a bit of a downer. They do offer some great food promotions with cheap lunches and buffets but compared to several other London casinos they fall quite short. The Mint has a couple of themed nights from time to time - everything from Bollywood to Arabic nights - where they have live music and themed cuisine. These are always fun to go to if you are in to the oriental or eastern flair. The Genting Mint is a walk in casino where you do not need to sign up to play. However, this means that you have to register for a newsletter to find out about any changes or promotions. This can be done with the front office staff. The Genting Casino Cromwell Mint is open 24 hours a day - 7 days a week to gamblers. The restaurant starts serving at 8pm and finishes at 1.30am. There are sandwiches and snacks available for most of the day and a breakfast buffet in the mornings. Why Genting Casino Cromwell Mint? 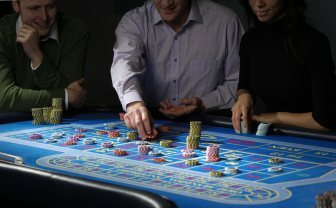 There are many casinos spread out across London but what sets this one apart is the massive emphasis they have put on a brilliant Poker experience. They have then combined it with a decent line-up of standard casino games to offer a nice experience that a lot of people will really enjoy. With a restaurant that offers nice meals and a good bar with sports on you can never go wrong if you want to visit this place for a full night out. One thing worth noting is that despite their lack of events they do have quite a few promotions that you will find out about if you sign up for their newsletter next time you visit. Mint welcomes everyone over the age of 18 to their casino. You can register for free at the club or online and gain instant access to exclusive member offers and club updates. The Mint Casino is open 7 days a week from 12pm to 6am. Live gambling starts from 2pm onwards.